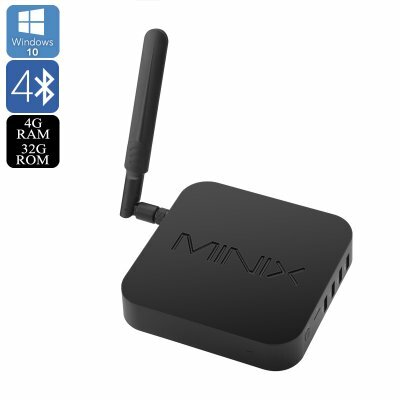 Successfully Added MINIX Windows 10 Mini PC - Intel X5-Z8300 CPU, 4GB RAM, 4K Movie Support, Dual-Band Wi-Fi, Intel HD Graphics GPU to your Shopping Cart. With the MINIX NEO Z8304 mini PC you will be able to take your personal computing experience to an entirely new level. Featuring a powerful Intel X5-Z8300 processor and 4GB of RAM this mini Windows computer is among the best of its kind, guaranteeing to bring value for your money. Running at 1.84GHz this Quad-Core CPU will smoothly handle whatever you throw at it, making this the perfect device on which to browse the web, enjoy games, watching 4K movies, and a whole lot more. Running on a Windows 10 operating system this Mini PC will provide you with the smooth user experience that you are used to when using a regular computer. Featuring an ultra-compact and premium design this fanless mini PC holds an astonishing amount of power within a small package. Thanks to its sleek and miniature design the MINIX NEO Z8304 can be easily carried around where ever you’re headed – allowing you to hold on to your mini PC filled with all your personal files no matter where you go. Supporting 4K resolution this mini computer can additionally be used as a high-end TV box, turning your regular television into a state-of-the-art Smart TV. Simply connect your TV to this epic mini PC and you’ll be able to browse the web, stream 4K movies, and play games on your large flat screen TV while sitting on your sofa in the comfort of your own living room. With this Windows mini computer / 4K TV box you will be able to enjoy year’s worth of fun and entertainment together with all your friends and family. So whether you like to sit back and play a game, or enjoy a true cinematic experience by watching a movie in stunning 4K quality with your family, this mini PC is guaranteed to meet all your entertainment needs. Featuring Dual-Band Wi-Fi connectivity this Windows 10 mini PC supports the fastest data speeds out there, providing you with lightning fast internet speeds. Download files in the blink of an eye and stream online movies in no time – with the MINIX NEO Z8304 mini PC a slow and laggy internet connection will be an issue of the past. Supporting 32GB of internal memory this Windows 10 mini computer offers enough space for you to save all your downloaded files, favorite movies, work documents, and a whole lot more. Being the perfect device for all tech-savvy people who like to enjoy the powerful features of a regular computer on a portable device – with the MINIX NEO Z8304 your possibilities are endless. The MINIX NEO Z8304 mini PC comes with a 12 months warranty, brought to you by the leader in electronic devices as well as wholesale electronic gadgets.. This device comes with a licensed version of Windows 10 Home 64 Bit. As a wholesaler, we provide no software support, advice, or training regarding the Android operating system and software.